Weddings in the New South bring up all sorts of issues never before encountered in the history of weddings. Last weekend, Carla and I took our oldest son, Barron, to his first wedding — the marriage of his youth minister, Matt Hester, and our friend Courtney Phillips. It was a beautiful and somewhat unorthodox ceremony and reception that was very personal and deeply rooted in their faith journey and family history. While we explained each element to Barron, who professed to be sleepy and yawned throughout, I couldn’t help but try to connect our Atlanta church friends to the ceremony, which was taking place in Courtney’s hometown of Orlando. We and two other couples were the only ones from our church in Atlanta who made it down for the wedding, and I knew the folks back home would want to participate vicariously in the celebration. OK, I know I could be making matters worse by sharing the offending image here, but you have to see it to make a judgment. It’s all about context. And isn’t it a lovely wedding? So, as the couple looked longingly into each other’s eyes and said their vows, I discreetly and silently took a photo with my iPhone. I wrote a simple caption and uploaded it to Facebook. Within minutes, several of our church friends “liked” or commented on the image and expressed thanks for my sharing it. When we got to the dinner reception afterward, I showed Carla the photo and proudly proclaimed how thoughtful I had been by sharing this with our friends back home. That’s when I got the speech. I began to doubt myself. We had talked about this at the last wedding we attended, and I couldn’t really remember, but I think I came out on the side of posting photos from a wedding in progress on Facebook was a no-no. “Yeah, but there’s a bunch of people back in Atlanta who couldn’t be here. They would want to see it,” I meekly retorted. Carla rolled her eyes in response. I continued to mull it over as we joined our friends at the table for dinner. By the time we sat down, Carla had already recruited our friend, Autumn, to her point of view. Carla swore that she didn’t prime Autumn to respond in her favor. That’s when the self-doubt really kicked in. Had I committed a faux pas? Should I have left well enough alone and let the new couple post the photos they wanted posted from their wedding when they were ready? This may be a rationalization, but beyond the idea that I was sharing this with our Atlanta friends who could not attend, I also thought “Hey, everybody’s doing it.” These were young people getting married. There were dozens of people holding up iPhones capturing photos and videos of the ceremony. I just assumed I was not the only one posting them to Facebook. And in my defense, it was a beautiful wedding. It was outside under a giant Live Oak tree draped in Spanish Moss, and it was the same location where her parents had been married. See! Beauty and meaning! It was practically begging to be shared on Facebook. I was so troubled that when we spoke to the bride and groom at the reception, I barely got out my congratulations before confessing what I had done. In their typical, laid back and inclusive fashion – the groom and groomsmen were wearing Chuck Taylors for crying out loud – Courtney and Matt shrugged it off and said it was fine. They were OK with it. So if the bride and groom don’t mind, is it OK? Not to turn this into an episode of “The Marriage Ref,” but I thought I’d let you decide this week: Am I guilty of prematurely sharing an indelible image from someone else’s important life event or was I sharing an event with people who could not otherwise participate because of distance? We have another wedding in a week, and I need to know how to behave. Leave a comment below and let me know how you feel on this issue. I don’t want to be still hashing this out with Carla at the next wedding! This entry was posted in Uncategorized and tagged Atlanta, contemporary South, family, Florida, Florida weddings, Lance Elliott Wallace, Lance Wallace, New South, New South Essays, NewSouth, outdoor weddings, photographs at weddings, relationships, South, Southern, Southern Culture, Southern Living, Southern weddings, Southerners, the South, weddings. Bookmark the permalink. 20 Responses to Wedding faux pas? Oh, you know me, I’m the king of discreet. At 6-foot-4 and with a goofy Beaker haircut, I blend in wherever I go. Seriously, I didn’t lift my hand up very high, hence the reason I got so much of the back of people’s heads. I too see where Carla is coming from, but this day in age is completely different. We went to a wedding a few weeks ago and instagram, twitter and fb where full of pictures from the wedding. We live in an insta-share society…..I think there is no turning back. I think if you don’t want pictures of your wedding shared, you have to be proactive now and say so in the bulletin, or make it so folks can’t tag you on fb…..both of which I have seen done…..In any case – I’m with you. I am with Carla. It was theirs to share first. You could have asked in the receiving line and then posted. I have to go ahead and apologize to Carla. This is the one and only time I will agree with you instead of her. If the wedding you are talking about going to next is mine, feel free to take the picture and post it on Facebook. We won’t mind one bit. It will take weeks before we will get our wedding pictures back and it will be nice to have one to share so quickly. Just be sure to put your phone on silent or you’ll have Linda King to answer to. I am not exactly a traditionalist when it comes to weddings since we eloped but I enjoyed seeing the picture myself. I confess to being a Facebook junky. I think a lot of etiquette is conditional. It is determined by the people involved, by those in relationship. I’d say best practice is to ask how the couple feels about posting in-process photos ahead of time (preferably not the day of the wedding). That gives them time to think about what they want beforehand. Some will be glad that someone is sharing pictures immediately with those who not not attend. Others will want to get their own photos out first. What the couple says determines what is/isn’t okay. I completely agree that etiquette is conditional. After all, the whole point in etiquette is to make other people comfortable and avoid awkward situations. However, during a wedding ceremony is not really the time to play social media guru. Aren’t you supposed to be paying attention to the wedding? And won’t other people think you’re just fiddling with your phone? When people host an event, they agonize over the guest list. We were honored to be included in their special day. But when we post pictures we are inviting all of our own FB friends to the event and it’s not our invitation to extend. In Lance’s defense, I felt much better after we congratulated the couple and he confessed the deed. They responded very positively. The next day I checked the bride and groom’s FB pages and saw that others had posted photos from the day as well. Lance certainly wasn’t the only one. I must confess that what it all boils down to is that I was worried about what other people would think of Lance for doing what he did. I knew all along that the couple of the hour would not mind. And then I felt really bad that in my concern for what other people would think, I ruined the wedding experience for my own husband by causing him spend the entire time worrying that he had done something wrong. Frankly, I’m glad that so many of you agree with Lance. I can take it. And it will help relieve any of his lingering concerns. Thanks for all the input, folks! I think for many of us journalist types, we almost forget how to be present at something without a camera. We’ve been trained that our role is to carry a camera and/or notebook and document. I’ve at times felt antsy at events where I was not doing those things — like I was doing something “wrong.” That is not to say that my feelings dictate appropriate behavior, just that some of us need to be retrained how to experience events without a lens. The above comment was made by me—Carla. Well Lance the best example for newlyweds is showing how a couple regularly learns to regroup and look at things from the others perspective. WELL DONE! I’d never even given it a second thought before. I always thought that people had to wait so long to get their professional photos back that they might like to see a couple on Facebook. One of my friends even used one of my photos as her profile pic until the professional ones came in. I definitely see what Carla’s saying, but in his generation, there’s no way you’re gonna keep that in check… So, I say, if you can’t beat em… Join em. I’d say it’s okay to take and post the photo, as long as you’re discreet! No one wants to miss seeing the actual event because someone in front of them has their phone up in the air. Flashes and phone noises would also be distracting. Speaking as a bride that this happened too… I loved it!! It was weeks before our professional pictures came back and I loved being able to see some beforehand. No Faux Pas for me. But I do agree that you should probably have asked. Some people might not have the same feelings that I do. Selfishly, I agree with Lance. I really enjoyed seeing that picture! Thank you all for your input. By the looks of things, I think the final answer is check with the bride and groom first. I just got lucky that the Hesters didn’t mind, but I could have made a serious misstep. I’ll be more careful in the future and always discreet. I was grateful that some of my friends posted pictures from our wedding on FB. It was nice to see the memories they captured (although none of them were from the actual ceremony). As the bride and groom represented in the uploaded photo, we express our deepest gratitude to Lance Wallace for his timely and responsible service of capturing our special moment and sharing it with the Facebook world. 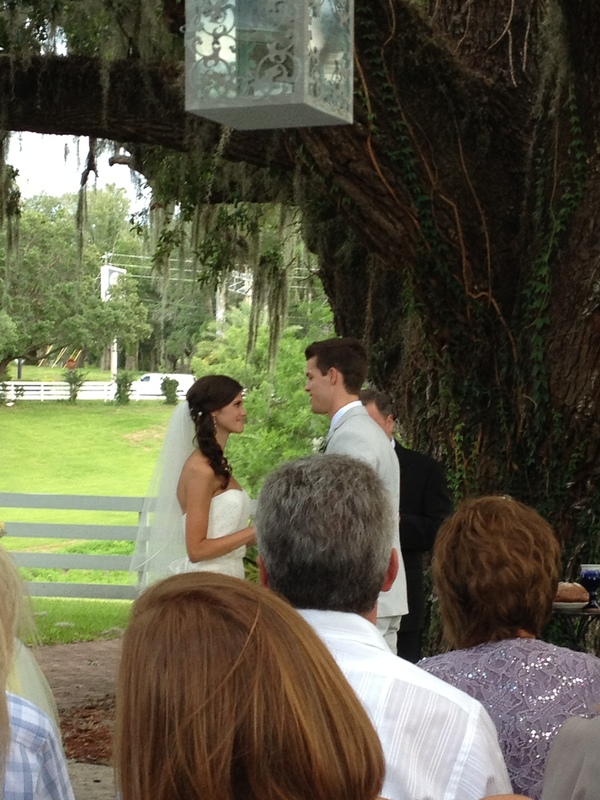 We personally could not wait to see a picture of our wedding from an attendee’s perspective. So we say thank you, Lance Wallace. You’re the man! Thanks, Matt. I appreciate you taking the time to weigh in on this question. Your wedding was beautiful, and I was honored to be there.